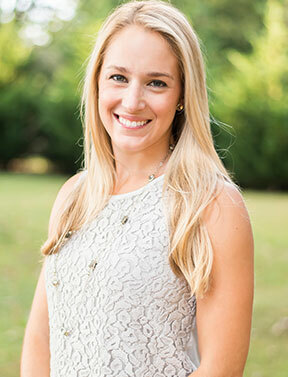 A Greenville native, Dr. Ashton Butler graduated from Christ Church Episcopal School (Class of 2004). While growing up, she was an avid horse lover and showed Hunter/Jumpers in local and regional shows. She continued to pursue this passion while at the University of North Carolina at Chapel Hill where she was a member of the club equestrian team. This participation in club sports turned out to have a significant impact on her life; it led to her meeting her future husband, Tom, a member of the club hockey team. She graduated from UNC in December 2007 with a BS in Biology. Following college, she had a spring semester free to gain valuable experience in the dental field. While awaiting the start of dental school, she worked for a dentist in New Orleans and spent her free time enjoying the wonderful food, music, and culture of Louisiana. In the fall of 2008, Dr. Butler attended the University of Maryland School of Dentistry in Baltimore, where she completed a two-year pediatric clerkship and was the recipient of three academic scholarships. She received her Doctorate of Dental Surgery in 2012. She then moved on to the Mountain Area Health Education Center in Asheville, NC to complete a one-year general practice residency. This advanced training program provided Dr. Butler with additional experience in all aspects of general dentistry, and she is committed to staying on the leading edge of dentistry through continuing education. Dr. Butler is passionate about using her dental skills to serve others. She has participated in two international dental mission trips, one to the Dominican Republic as a dental student and another to Uganda following her residency. She has also volunteered domestically through the NC Missions of Mercy free dental clinics and other local organizations. Dr. Butler happily returned to Greenville in the fall of 2013, where she and Tom were married. They have a cat, Andouille (Andy). Outside of the office, Dr. Butler enjoys Crossfit, horseback riding, cooking, South Carolina football, and North Carolina basketball. She loves to spend time outdoors and be with friends and family. Please help us in welcoming Dr. Ashton Butler to practice!